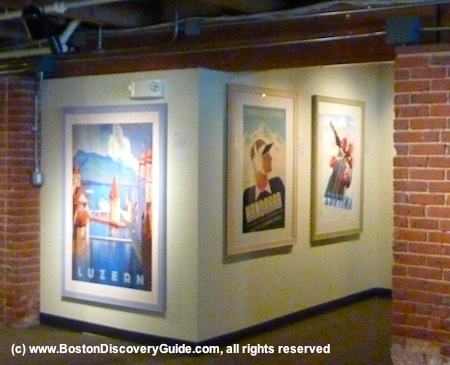 Despite its name, Grand Circle Gallery in Boston's Fort Point area functions more like a small specialty art museum, displaying spectacular vintage travel posters and photographs from the private collection of its owners along with special exhibits focused on particular subjects or artists. Grand Circle Gallery's extensive collection of travel posters captures the romance of travel to destinations around the world - Africa, South America, Asia, Europe, and more. Most of the posters in Grand Circle Gallery's collection date from the "Golden Age of Travel," a period from the early 20th century up until the beginning of World War II, a period when transportation by air, land, and sea became easier, safer, and more accessible, and people could start to travel for the pleasure of traveling. Although posters on display from the permanent collection rotate, they collectively give you a glimpse of the adventures Golden Age travelers pursued . . . massive ships gliding through blue oceans, sleek airplanes and debonair aviators, early automobiles heading off across the landscape . . . snow-covered mountains, coastal villages, and stunning architecture . . . wondrous sights such as the Taj Mahal and Eiffel Tower. 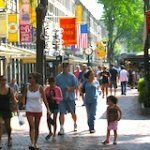 Grand Circle Gallery presents special Boston exhibits throughout the year. For example, a recent exhibit featured numerous vintage posters from South America, many with stunning colors and visual imagery. Another exhibit featured work by Boston area graphic design students from Massachusetts College of Art and Design, Curry College, Northeastern University and Monserrat College who participated in a juried competition to design posters promoting the culture, traditions, history, or attractions of top travel destinations. I had the good fortune to see this exhibit, and am happy to report that many of these contemporary posters are just as visually compelling as their vintage predecessors. 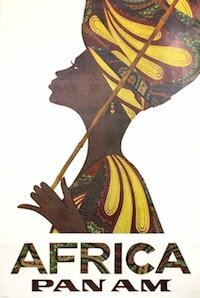 The recent "Travels through Africa" exhibit features more than 30 stunningly beautiful vintage posters depicting romantic - and romanticized - scenes in North Africa and Egypt, sub-Saharan coastal regions, Lake Victoria in the interior, and tropical forests in central Africa. In addition to the vintage travel posters, Grand Circle Gallery also exhibits black and white photographs. A previous special exhibit featured travel photographs. Grand Circle Gallery is part of Grand Circle Corporation, which has its headquarters upstairs from the Gallery and is known for its special river and small ship cruises (it owns or privately charters a fleet of 35 vessels), off-the-beaten-path adventure destination travel groups, and unique international vacations for travelers over 50. 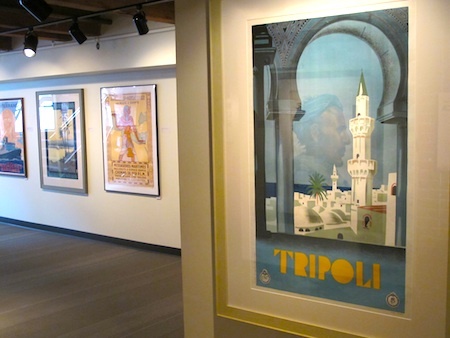 The gallery features art from the collection of Grand Circle Corporation's owners, Alan and Harriet Lewis, as a way to share their passion for travel, vintage travel posters, and the creation of awareness of social issues through art and photography. 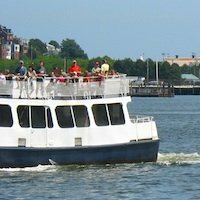 Location: 347 Congress Street, in the Fort Point Channel area of the South Boston Waterfront neighborhood just across the channel from downtown Boston. Hours: Wednesday, Friday, Saturday 11am - 6pm; Thursday 11am - 8pm. 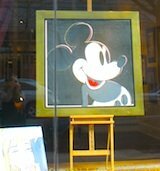 Unlike most other Boston galleries which display work available for purchase, the art featured at Grand Circle Gallery is not for sale at the gallery. 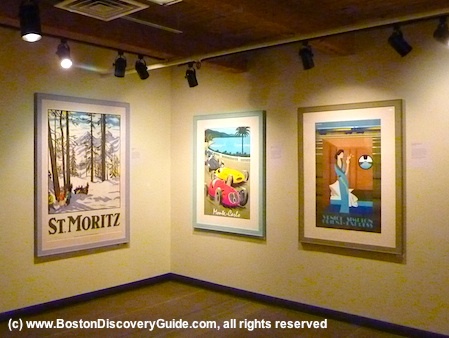 If, however, you visit and fall in love with vintage travel posters, you can head over to International Poster Gallery on Newbury Street, where you'll find an enormous collection of posters of all types - I'm a periodic browser and occasional customer myself. In some shows, such as "Travels through Africa," some works are on loan from IPG (such as the photograph of the poster at the right, which is provided courtesy of IPG) and may be available to purchase through them. Although the lithograph process used to produce these vintage travel posters means each print is somewhat unique, multiple images increase the collecting opportunities. Who knows, maybe you'll start your own collection!